Trump’s attacks on the media are getting evermore virulent. Much is known and has been written about the “what.” Not too much about the “why.” It’s not because Trump is a nut, an ego-maniac, the knowledge-free leader of the most powerful nation on Earth. Yes, he is, but the primary reason for the media-assault is to help pave the way for the establishment of a 21st-century form of fascism in the U.S. The media is the last major institution standing in the Trumpites’ way. In great detail, many have written about the Trumpite’s increasingly ferocious attacks on the media and how horrendous they are, in one sense or another. That is the “what” of this topic. But we also must look at the “why?” Why are the Trumpites doing this? After the election, there were two main sets of institutions that could have stood between the Trumpites and the establishment of some form of 21stcentury fascism, the increasingly obvious principal goal of the Trumpites: the Judiciary and the media (see below). Congress is in their pocket. The public is widely split. With the Republican Senate, the stealing of the Garland seat by Mitch McConnell and 135 Appellate and District Court seats (that Mitch McConnell preserved for Trump to fill), the Judiciary is falling fast. So now the Trumpites are going after the media. This is happening not because Trump is an ego-maniac (he is, but that’s not the reason). It’s not that he knows nothing but attacking the media gives him something to do (he doesn’t know much, and does have fun doing what he is doing to Joe and Mika et al. But that’s not the reason either). It’s not because he is “crazy.” In my view, this man is crazy like a fox; he knows exactly what he is doing and is delighted to elicit the response he is eliciting. He is indeed the master of not one but two sets of WMD’s. The one here is the Weapons of Mass Distraction. His campaign is indeed helping him rally “his people” to his cause even if they don’t know yet what his cause is and how it will hurt some (his working-class supporters) — but certainly not all (his petit bourgeois supporters) — in the long run. But that’s not its primary purpose either. The Trumpite attack on the media is rather because to eventually make the US into a fascist country of one form or another (that has yet to be fully defined — but it will be some 21stcentury variantwhich, in this country, will likely be made to appear Constitutional) he must destroy the media. He must get them out of the way. While he himself is a rampant liar,he must get them out of the way. He must destroy their credibility. He must artificially create so much mis-trust in them that many people on the Right (and indeed some on the Left too as they already are) will automatically repeat the Trumpian phrase — “fake news,” “fake news,” over and over again until they actually believe it. It matters not how many lies Trump tells. In this space, I have written many timesabout Trumpand fascism. Unlike certain other of my colleagues on the Left, I have been convinced that Trump, in practice if not in mind, is a fascist, of the 21stCentury variety. And with Steve Bannon in his ear, Trump does not have to know much, if anything at all, about fascist theory and practice. For Bannon is an acolyte of the Italian post-World War II Mussolini hanger-on Julius Evola. 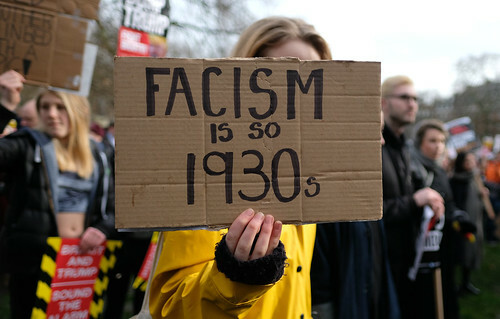 Despite the 20thcentury experience with fascism in many countries around the world in addition to the Big Three World War II Axis Powers — Germany, Italy and Japan — one can add, for example, Spain, Portugal, Chile, Brazil, Argentina, and Hungary —, Evola thought it was just a great system. And so, apparently, does Bannon. Since Trump ran his companies like a personal fascist empire, from one-man control to a complete disregard for ethics and morality in business, to working around the law as often as he could, and etc., he is the ideal pawn for Bannon and the proto-21stcentury fascists. And he certainly has exhibited fascist/authoritarian wishes/tendencies since he came into office, from the spewing of executive orders to the idiotic scene of having cabinet members bow down to him in allegiance. In the United States, the economically dominant wing of the ruling class, which rallied around Trump towards the end of the election campaign, apparently feels that things are getting out of control. Life is getting worse for the majority of the U.S. people and, they think, sooner rather than later, that people is going to begin to rise u, they are going to realize that bourgeois democracy and the bourgeois rule of the ruling class simply aren’t working for them anymore. Obviously, although it may not be obvious to many of us, that is what some significant element of the U.S. ruling class has concluded now. Ergo Trump (and Bannon/Evola). And so, what is to be done, by them? There is full Executive control of all functions of government. There no body of law, that is a Constitution, standing above the unitary power of the Executive. collective violence to achieve political and economic ends. The end of the separation of powers and the ability to ignore the basic concepts of Constitutional government are primary goals of any fascist regime. Trump is an obvious authoritarian who is well on way to doing that. And so, what does Trump have so far to facilitate the passage? A) a compliant Congress, with no indication that the Repubs. Are going to turn against him any time soon. He is accomplishing too much for their mutual bosses. Not through the legislative route of course, but through the demolition of regulation he is achieving one of the two most recurrent Republican goals since the time of Goldwater, with amazing rapidity too. B) He is well on his way to taking over the Federal judiciary, at all three levels: Gorsuch (described by one left-wing critic as “worse than Scalia,” if you can imagine that), whoever is next for the Supreme Court and about 135 Appeals and District Court Federal judges that Mitch McConnell prevented Pres. Obama from appointing. C) They are going after voting rights with a vengeance. They are getting very significant opposition to the Kobach initiative for massive voter fraud/intimidation, (the voting fraud being created by intimidation by the Kobachers who would go after the non-existent variety), but who knows how long that will last. And then we come once again to the media. As noted, the two most significant hurdles that Trump/Bannon faced for creating a fascist takeover when they came into office were the courts and the media. The courts they have gotten out of the way very quickly. But then: “Adolf Hitler [had] advocated total control of the press for many years before he was elected Fuhrer. Almost immediately after he assumed power in 1932, Hitler began writing new laws and regulations that totally exorcised all freedoms from the German press.” Hitler had had the “Luegenpresse” (the “lying press” [sound familiar?] for years). This is where they are going folks. They want to so denigrate/discredit the media (not theirmedia of course) that when Congress passes the Emergency Powers Act (after McConnell has done away with the filibuster rule for such “emergency” legislation), that Trump will be proposing down-the-line on some pretext or another (who knows how many US lives will be lost in that one) the Courts will not be there to stop him. Only the media would be left. It is this, not simply endless attacks on the mediafor the sake of attacking, that is the goal of the Trumpites. And indeed, some White House aides already think that they are winningthe War on the Media. The media attack has another major function, only slightly less important the one described in detail above. It is Trump’s major Weapon of Mass Distraction (also mentioned briefly above). While the War on the Media is underway, full force, all the other wars that Trump is conducting at the same time, foreign and domestic, receive less and less attention. The fact that his Administration is woefully understaffed receives very little attention. The fact that he is engaging in a variety of provocative actionsagainst foreign powers all around the world receives less attention. The fact that a War on the US Poor at many levels is underway receives less attention. His plan for dealing with climate change — make it worse — receives less attention. His wars on public education, on the remaining, tattered, rights of labor, on the regulation of the nuclear energy industry, on the Federal civil service, starting with the EPA, and here’s one egregious instanceat Justice, and so on and so forth — all receive less attention. For good reason. Trump has his own WMD, and uses them with great effectiveness. Steven Jonas, MD, MPH, MS is a Professor Emeritus of Preventive Medicine at StonyBrookMedicine (NY) and author/co-author/editor/co-editor of over 35 books. In addition to his position on OpEdNews as a “Trusted Author,” he is a Senior Editor, Politics, for The Greanville Post; a Contributor for American Politics to The Planetary Movement;a contributor to the “Writing for Godot” section of Reader Supported News; and a contributor to From The G-Man. Furthermore, he is an occasional contributor to BuzzFlash Commentary Headlines and The Harder Stuff. He is also a triathlete (34 seasons, 251 multi-sport races). This entry was posted in Donald Trump, government, media, politics, Uncategorized and tagged fascism, Steven Jonas, Supreme Court. Bookmark the permalink.